Home » Health » What Is Dysphagia? Dysphagia is a medical term which means it is difficult to swallow. For people who experience this condition, the process of channeling food or drinks from the mouth into the stomach will require greater effort and longer time. Oral phase. This stage occurs when food is in the mouth. This stage involves the process of chewing food, transferring food from the front to the back of the mouth, and the process of preparing to deliver food to the pharynx and esophagus. After the food is ready to be swallowed, the ingestion will go to the next stage. Pharyngeal phase. This stage involves two main processes, namely pushing food from the mouth to the esophagus, and the stages of protection of the respiratory tract from food. This stage takes place quickly for a few seconds. Esophageal phase. This stage occurs when food has entered the esophagus. Food will be pushed from the top of the esophagus with a wave-like movement (peristalsis) that belongs to the digestive tract and this movement is regulated by the autonomic nerve, which is the nerve group that works automatically without command. Gravitational force also helps food to enter the stomach. 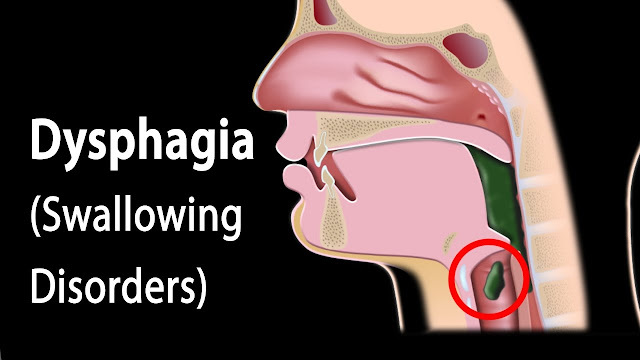 Dysphagia is divided into two types based on location, namely oropharyngeal and esophageal. The division of this type of dysphagia is based on the phase in the process of swallowing. Oropharyngeal dysphagia occurs in the oral and pharyngeal phases, while esophageal dysphagia occurs in the esophageal phase. Food feels stuck in the throat or chest. Choking or coughing when eating and drinking. Food that has been swallowed back again. Patients often cut food into small pieces due to difficulty swallowing or even avoid certain foods. Food or drink often comes out of the mouth. Frequently vomiting food while eating. Do not want to eat certain foods. Losing weight for no reason. Nerve damage due to radiotherapy or surgery. Cancer of the esophagus, head or neck. Muscle tension in the lower esophagus. Narrowing of the lower esophagus due to scar tissue formation, for example after radiotherapy. Esophageal swelling or narrowing due to inflammation or GERD disease . The existence of objects that clog the esophagus or throat. A person will more easily experience dysphagia with age. This is caused by naturally occurring muscle weakness and an increased risk of developing diseases that cause dysphagia. In addition, people with neurological disorders are also more prone to dysphagia than people who do not suffer from neurological disorders. Do not ignore if you feel difficulty in swallowing and immediately go to the doctor to get the right diagnosis. Because with the right diagnosis, treatment will be effective and will also reduce the risk of complications, such as weight loss, malnutrition , dehydration, choking, or even pneumonia . As a first step, the doctor will ask about the symptoms the patient feels, including the severity and how often the symptoms appear, the doctor will also check the body mass index (BMI / BMI) to see if the patient is malnourished due to difficulty swallowing. Then the doctor will ask the patient to drink water in a certain amount as soon as possible (water swallow test) . Note the time obtained and the amount of swallowed water can help doctors assess the patient's ability to swallow. Endoscopy. This check is done with the help of a special flexible hose and equipped with a camera and lights. Images captured by the camera will later be seen by doctors through the monitor screen. Endoscopy can be done to check the condition of the upper respiratory tract, namely the nose to the throat (nasoendoscopy), or check the condition of the esophagus to the stomach ( gastroscopy ). Fluoroscopy. This examination uses X-rays and is guided by a special substance as a contrast called barium. In contrast to ordinary X-ray photos, fluoroscopic shooting is carried out continuously, so that it can record movements during the swallowing phase. Manometry. This examination aims to see how well esogafus works by measuring the amount of muscle pressure on the organ when swallowing. Manometry uses a catheter or a small, special hose equipped with a pressure sensor. Manometry is also usually performed in conjunction with the measurement of stomach acid levels in the esophagus. Imaging. Imaging is done to see the condition of the mouth to the esophagus in more detail. Imaging can be done by CT scan, MRI, or PET scan. Modified diet . Dietary modification is done by adjusting the texture and thickness of food according to the ability to swallow the patient. Disphagia patients who undergo this treatment are generally patients who have difficulty swallowing in the oral phase. Patients can arrange their food starting from runny liquid-shaped foods such as juice, then increase the thickness if the ability to swallow has improved, so that later can be given back solid foods, such as bread or rice. Therapy swallows . Therapy for swallowing in people with dysphagia will be guided by a special therapist. The therapist will teach how to swallow during the healing period so that the patient can still swallow food. This therapy is carried out especially for patients who have difficulty swallowing due to problems in the mouth. Hose to eat . Feeding hoses are generally done to help patients meet their nutritional needs during the recovery phase of the mouth and pharynx. In addition to helping to put food into the digestive tract, the feeding hose can also be used to enter medicines. There are two types of feeding hoses, namely the nasogastric tube (NGT) and percutaneous endoscopic gastrostomy hose (PEG). The NGT hose is placed through the nose then towards the stomach. While the PEG hose is inserted directly into the stomach through the outer skin of the stomach. Medicines to reduce stomach acid, such as ranitidine and omeprazole . These drugs are usually used in people with dysphagia due to gastric acid reflux (GERD), as well as to reduce complaints of heartburn that may occur in people with dysphagia due to narrowing of the esophagus. Botulinum toxin is injected into the lower esophagus to paralyze rigid esophageal muscles due to achalasia . But the work of botulinum toxin only lasts about 6 months. High blood pressure drugs for calcium inhibitors, such as amlodipine and nifedipine. These drugs can be given to relax the muscles if there is tension in the lower esophageal muscles. Dilated. This method of operation is done using an endoscope guide, which is a camera hose to get a clear esophageal picture. After that, the narrowed portion of the esophagus is dilated with a balloon or a busination tool. Stent installation. Stents are metal tubes that can be installed in the esophagus to widen the narrowed esophageal canal. Stenting is recommended in patients with esophageal cancer who cannot be removed compared with dilation, because cancerous tissue is at risk of tearing when dilated by dilating techniques. Stents will be installed with guidance on X-rays or endoscopy. Stop drinking alcohol, smoke, and drink coffee. Changing eating habits. The diet of dysphagia sufferers is arranged to be fewer in number but more often. Pieces of food are also broken into smaller pieces and when you eat, you have to chew for longer. Avoid foods that cause symptoms to get worse. Some foods that are thick and attached to the esophagus can make the process of swallowing more difficult. For example jam, butter or caramel. Some people with dysphagia also have difficulty swallowing fluids, such as juice. If not treated properly, dysphagia can cause unwanted complications. People with dysphagia can experience malnutrition, dehydration and weight loss due to lack of nutrition and fluid intake. In addition, people with dysphagia can also experience respiratory disorders such as upper respiratory tract infections and pneumonia. Respiratory problems due to dysphagia are caused by food or drinks that enter the respiratory tract when swallowing. 0 Response to "What Is Dysphagia?"